The best editor helps you easily edit YouTube videos with powerful features. Streaming online videos on YouTube has become a lifestyle for almost all of us now. But time and data usage are a huge constraints. Isn’t it annoying when you find free Wi-Fi but lack a suitable video downloader or you have a downloader but no Wi-Fi access at the moment to stream the videos. 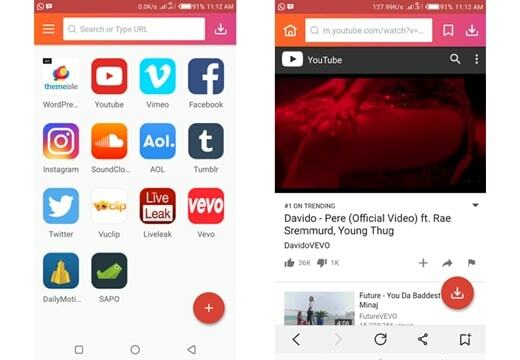 To solve your dilemma and let you download YouTube videos on your Android phone, we have mentioned the most popular YouTube video downloader for Android in this article. Using TubeMate, you can now save your favourite YouTube videos directly on your phone and cherish them anywhere offline. You can choose the quality of the video as this tool supports different resolutions. If you are a novice users this App is simple as one two three, you just need to search the video on YouTube and tap the green arrow at the bottom of the screen to download it. Multiple download options are available along with the background download option to carry on with other routine work on your phone. It can download video as well as audio. Videos can be converted to MP3 format. It cannot download in 4K format. TubeMate doesn’t download the original YouTube video, rather a video encoded video by YouTube. Hence, the video sometimes fails to play and downloading a low-resolution video to save YouTube videos on Android might help. Dentex is a YouTube video downloader for Android that allows you to download YouTube videos within seconds. The interface is divided into 3 parts. In the first part, you can search the YouTube video and see the results, the second part shows the quality and format options, whereas the third part lists the previously downloaded videos. You can change the format of any video even after downloading. You can extract audio files from the videos and later convert it to MP3 format. You can remote download through SSH. An additional plug-in is required to change the format of the video. The app is not compatible with lower Android versions such as Gingerbread, Froyo and Éclair. The downloading process might stop sometimes, requiring you to resume the process. 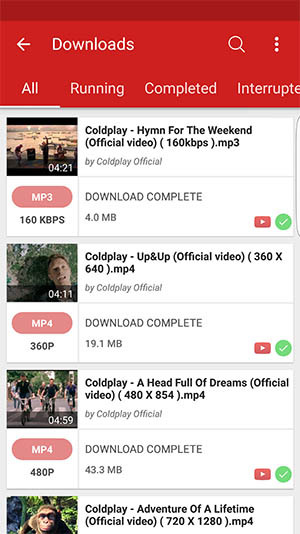 InsTube Free Video & Music Downloader allows you to download YouTube videos at high speed supporting MP3, MP4, 3GP, as well as M4A formats. Downloading YouTube videos in HD, Full HD, or 4K is at your finger tips with this tool. You can download videos from more than 40 websites apart from YouTube and enjoy them offline. It has an inbuilt locker to protect videos and keep them private. Hassle-free and neat interface allows easy operation. Faster downloading options across 40 plus websites and free YouTube video download is also possible. Unwanted Ads popup on the screen forcing you to install updates. You see the clipboard identifier icon only for few seconds on the screen. With WonTube, you can stock and save YouTube videos on Android. Its high conversion speed saves your time. The simple interface of the App makes it user friendly. The App can merge videos and convert the result to any format is a very unique feature. It supports AVI, WMV, MP4, MKV, FLV, 3GP, and MPG. It works well with poor internet connectivity as well, compared to other video downloaders. It can convert videos into 20+ formats. Even though multiple videos can be downloaded at the same time, but the same batch videos can be converted only to one output format. NewPipe analyses YouTube videos by itself to obtain the necessary information for downloading the videos. This downloader can thus work with phones that do not have Google Services installed in them. The app allows you to download audio and video with different formats and resolutions. 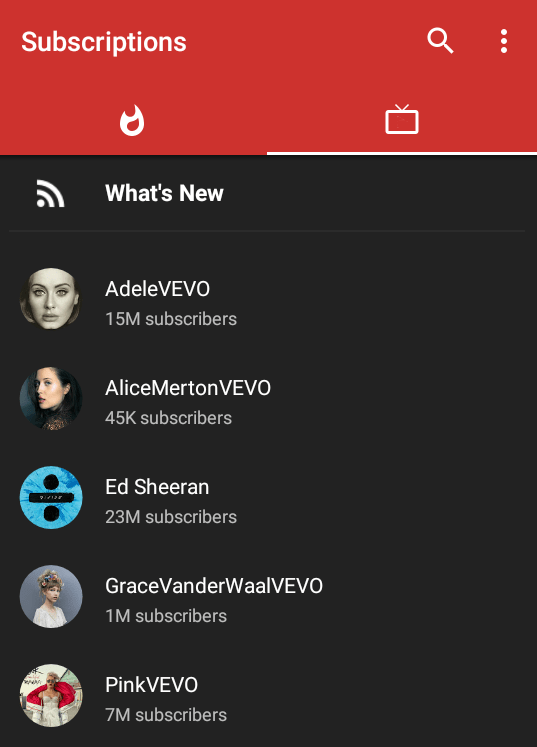 NewPipe also keeps you updated about your favourite YouTube channels while you save YouTube videos on Android. It has a pop-up mode which is movable and resizable, using which you can watch the videos while carrying out other activities in your mobile. It doesn’t have a log in option, so you cannot view your history. SnapTube is yet another amazing video and audio downloading app to download audio in MP3 format and video in MP4 format. The app is organized in itself, carrying a section of popular videos, most viewed videos and a daily recommendation section. 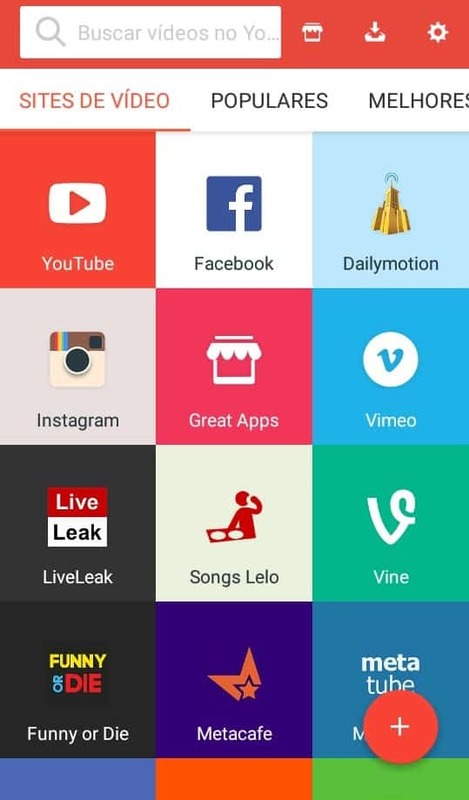 The app also allows video downloading option from popular social media sites such as Instagram and Facebook. It does not require additional plug-in. It does not have malware and Ads. YouTube multimedia download is restricted in India and China. 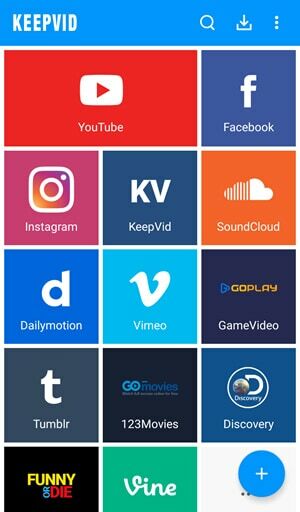 Videoder is the app for you when you want to broaden your horizon and download videos from Facebook, Instagram, YouTube, Hotstar etc. in MP3 or MP4 format. It comes with an inbuilt feature to convert videos to MP3 format. You can personalize the app by using themes, setting cover art, and tag editor to organize your playlist in a visually attractive way. Looking for HD quality viewing? You have 4K quality videos with Videoder. Multiple downloading is possible with a single tap. Downloading speed is accelerated by the number of network connections and utilizing it to maximum. Because of the numerous features, it may take time to learn all the functionalities. An audio encoding pop-up may sometimes appear asking to install plug-in. It doesn’t support files other than MP3 and MP4 format. KeepVid is a handy YouTube downloader that can download videos not only from YouTube but also from 27 other sites. It is an amazing downloading tool that comes with a user-friendly interface and allows you to download videos from a huge number of sites including YouTube, Vimeo, and Dailymotion. KeepVid also allows you to download multiple videos at the same time with the option of selecting the quality of the videos. The app does not have any size limit to the video. It does not have any Ads. It can download videos as good as 4K. The only disadvantage is that you must download the app from the official site KeepVid.com. In the end we would like to say that as time passes by and with the tight schedules a YouTube video downloader on your phone frees you from your computer. For all those offline viewing needs of yours, the above-mentioned downloaders are excellent alternatives and help you save YouTube videos on Android.